The location: Body Washes Ashore on Beach. A. In Episode 5 (of Season One), "Love American Style". In a brief scene, we see bikini-clad girls running across a beach filled with tourists. As the camera pans the beach, we see a young couple jogging together down the beach. Suddenly, they stop, as the girl looks down and screams. 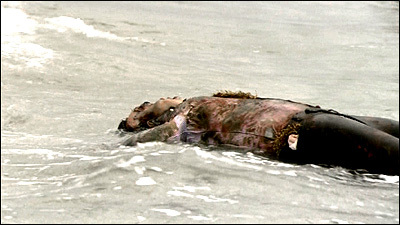 The camera shows what she has seen: the bloated body of a dead man, draped in seaweed, has washed ashore and is floating in the shallow tide. A. A beach, but not in Miami. A. They shot this scene on the beach of Fort Lauderdale, Florida (about 30 miles north of Miami), near the north tip of South Beach Park, with the camera looking north/northeast from the beach. They filmed it near the same spot where they shot the earlier scene (in Episode 4) where the cops find a severed hand on the beach. Here is an aerial photo of the beach. And here is a map link. A. I had previously tracked down Fort Lauderdale as a filming location for the scene with the severed hand. So when I caught the brief glimpse of the beach in this tourist scene, I thought it might be the same beach. Live Local doesn't have Birds-Eye view photos in Fort Lauderdale, but I matched the buildings in the scene with a skyline photo of Fort Lauderdale and was able to identify several Lauderdale buildings in the background of the scene.